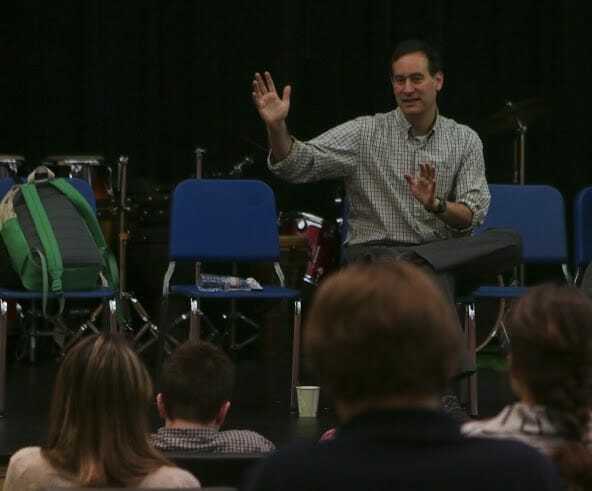 Students, faculty and staff read David Levithan’s young adult novel, Every Day, over the summer and gathered in Lawrence Auditorium on Sept. 17 for a talk by the author, followed by a Q&A in Towles. As members of book clubs and intimate literature classes know, shared reading experiences can lead to meaningful conversation and greater empathy. Community Book Day at Nobles magnifies this likelihood and encourages thoughtful discussion throughout the year. This year’s narrative, Every Day, centers on a teen named A, who awakes in a different body every morning. The novel explores the implications and complexities of that existence, from gender and relationship issues, to the need for human attachment and instinct for self-preservation. But— no spoilers here— the key to A surviving this fractured existence is to focus on values parallel to values held up at Nobles: how to find connections with others and appreciate how the ways in which we are different can enrich our lives. Levithan has published several novels, among them Boy Meets Boy and Nick and Norah’s Infinite Playlist. During his talk, he entertained questions about the characters and their motivation in Every Day and shared perspective on the creative process. Levithan’s process does not rely on outlines, he said. “I don’t think that much before I write. I just go.” Unlike many of his contemporaries (and he’s polled them! ), he doesn’t visualize the story or characters as he writes. He zeroes in on the words. When writing Every Day he said he became frustrated by the lack of a gender-free pronoun: A is neither male nor female. Levithan challenged the Nobles community to reflect on the “cruelty of language”— how it can influence cultural perceptions and perpetuate discrimination. How much of who we are is defined, either by others or ourselves, by visible attribute rather than a soul within? As an editor for Scholastic, and as an author, Levithan is optimistic about trends in young adult literature and the proliferation of diverse voices in fiction. His next book, Another Day, to be released in August 2015, explores the same timespan as Every Day, shifting the point of view from A to Rhiannon, the girl who falls in love with A. Until Another Day arrives, however, Levithan has given the Nobles community of readers plenty to discuss.